The HotLok® Blanking Panel is Upsite’s latest cost-effective green solution for energy consumption savings and carbon footprint reduction in data centers. 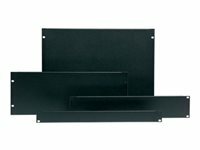 It is a next-generation, patent-pending blanking panel that provides a 99+ percent effective seal for both 1U and 2U openings in IT equipment cabinets. Both 1U and 2U versions, with or without a mounted Upsite™ Temperature Strip, help control hotspots and bypass airflow for optimized cooling effectiveness by preventing hot exhaust air or hot-aisle air from migrating to the air-intake stream at the front of the cabinet. Depending on placement in the cabinet, HotLok Blanking Panels help deliver more cool air to the upper one-third of the cabinet, which is typically the hottest section and most prone to hotspots and equipment reliability problems. The lightweight plastic unit is ergonomically designed to facilitate fast, easy, safe, tool-free installation and removal. Snap the Blanking Panel into any 19-inch EIA-310-E standard rack opening using the ample, inboard finger grips, designed to prevent injury to fingernails and knuckles. Removal is just as simple. The Blanking Panels neatly stack 10 high (for 1U openings) and 20 high (for 2U openings) anywhere in the server room, making them readily available for rapid equipment reconfiguration and eliminating the need for particulate-emitting storage containers. The energy-efficient cantilevered sealing vanes eliminate the gap between adjoining HotLok Blanking Panels or with installed equipment, providing a snug seal and no air leaks. All HotLok Blanking Panels are fire-retardant, made of 100 percent recyclable ABS plastic, and RoHS compliant.